Let me start by saying that however cynical you might be about the United States government (and I pass no judgment on such cynicism) the Capitol Building is huge and beautiful and meant to be symbolic of the things that are right about the United States and our democracy. Most impressive to me is the fact that anyone can visit it for free. As was the case with many American children of the 1970s, my own interest in the Capitol Building was first prompted by repeated viewings of the Schoolhouse Rock cartoon “I’m Just a Bill” on Saturday mornings. My boys have both learned about it in school and were excited to see the real thing. Since my last tour was in 1994, I had never seen the Capitol Visitor Center, which opened in 2008. I was really impressed with the gorgeous space, especially the main area called Emancipation Hall. 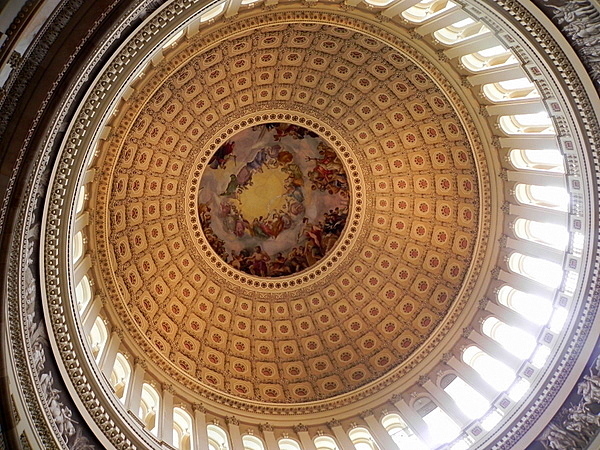 Although it is underground (for both security purposes and also so as not to obstruct the view of the Capitol from the outside) it has enormous skylights that flood it with natural light and offer views of that impressive white dome. 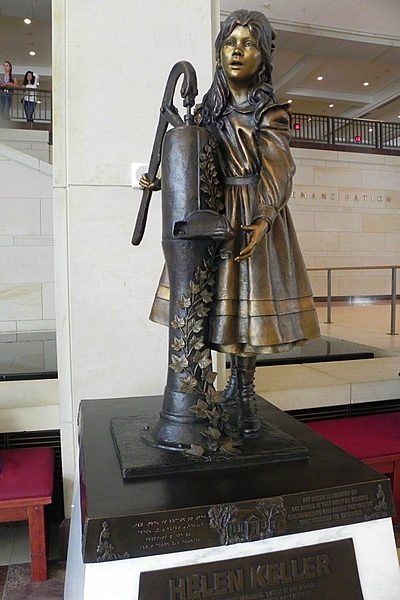 Some of the statues from the Capitol Building itself have been moved there including a personal favorite of mine, Hellen Keller, immortalized at the water pump. 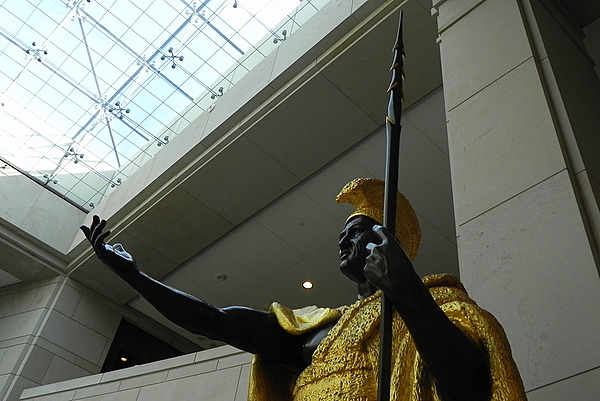 King Kamehameha of Hawaii now resides here as well. We later learned that this is because he weighs so much (over 14,000 pounds!) that he actually was in danger of causing structural damage to the Capitol building. Additionally, he needs to be placed where no one can walk over his head per the request of the Hawaiian people. And so now he points forever skyward from his new residence. 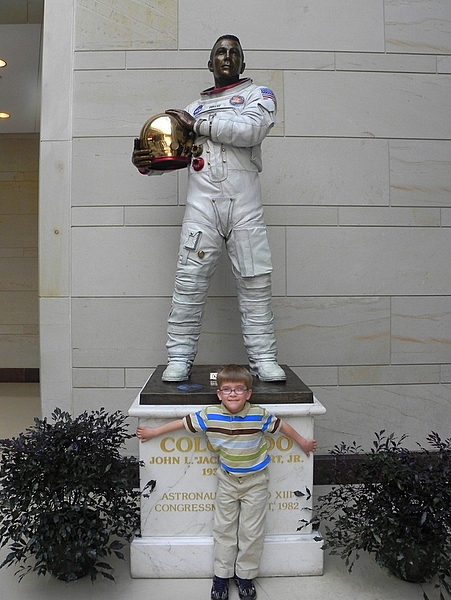 The boys’ favorite statue was Jack Swigert, one of the Apollo 13 astronauts. He’s the one that Kevin Bacon played in the movie – and who also uttered the words “Houston, we’ve got a problem”. The space suit definitely adds to his cool factor don’t you think? 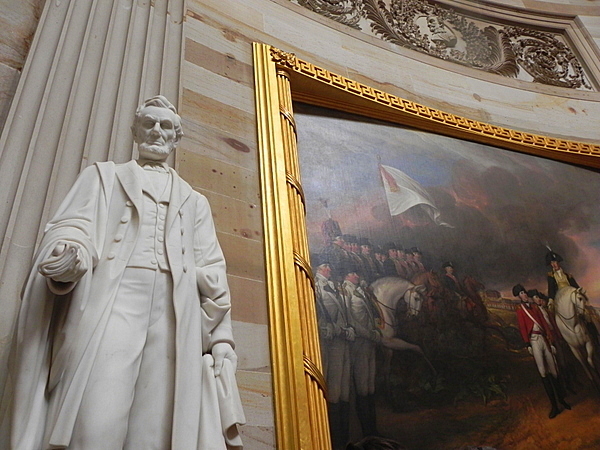 All tours of the Capitol Building start in the Visitor’s Center with a brief film offering a historical overview of the building and its construction, including a pointed acknowledgement that much of the work was done by slaves. After the movie, visitors are placed in groups of about 20 to 30 people for each guide. The tours use Bluetooth technology, which allows the guides to speak normally while guests hear them using headphones. 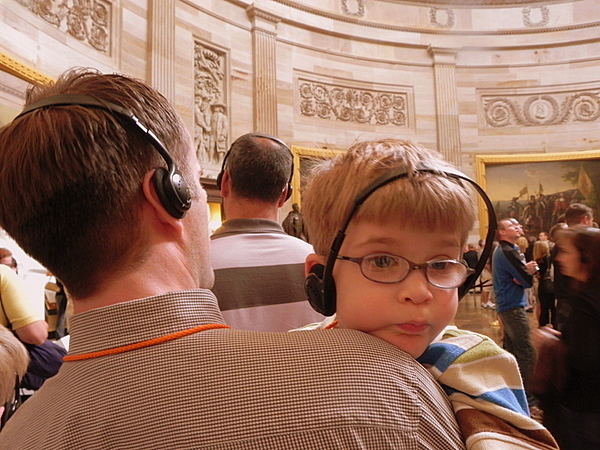 This is an especially great way to make sure that kids are able to hear and focus on what is said, even in the crowded and echoing spaces included in the tour. Our guide was chatty and knowledgeable, offering numerous stories and facts and about American history and politics throughout the tour. We started in the Crypt, which has a low ceiling and many columns. This is where George Washington was intended to be buried, but as our guide told us, he nixed that plan and lies at Mount Vernon to this day. The main point of interest for us here was a statue of Caesar Rodney, signer of the Declaration of Independence from Delaware. After that, we moved up to the Capitol Rotunda, famous as the place where presidents have lain in state after their deaths. This is also where Congressional gold medals are awarded. 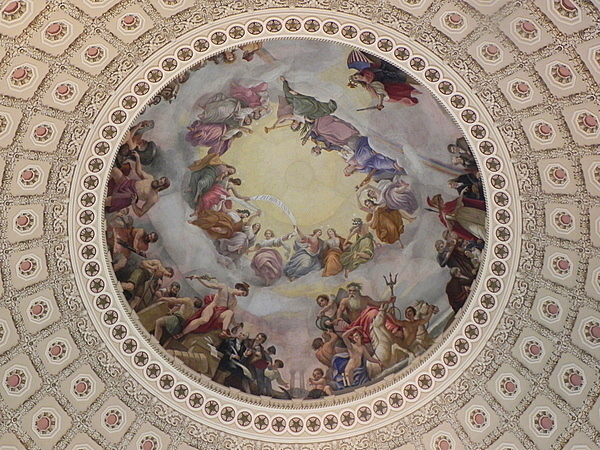 The guide started at the top, explaining the significance of the fresco in the huge dome (it’s called The Apotheosis of George Washington and one wonders if he would approve of seeing himself forever floating in heavenly grandeur with the Goddess of Liberty on his right) and worked her way down, talking about the history of the room and its art. Since every painting here tells stories about American history, this is an opportunity for some real learning. Tommy particularly liked seeing the iconic image of Thomas Jefferson in The Declaration of Independence. We finished our tour in Statuary Hall, where the House of Representatives met for nearly 50 years in the nineteenth century. Plaques in the floor show where the member’s desks where, including that of John Quincy Adams who, as our guide told us, may have taken advantage of the hall’s acoustics to eavesdrop on conversations across the room. She then had us take our headsets off and proceeded to demonstrate that we could hear her from across the room, even if she spoke in a low tone. Given the general din of all the other tours, this was pretty impressive. She answered lots of questions about the different statues in the room. I made sure to snap photos of Bob La Follette and Ethan Allen, heroes of Matt and my home states of Wisconsin and Vermont. The Visitor’s Center includes another space called Exhibition Hall, which we missed. I wish now that we’d gone back after our tour and poked around a little, but the boys were agitating for lunch and to get outside so we left. On a return visit, I’d try to arrive there earlier so that we had a chance to explore the touchable model of the Capitol dome and some of the other interactive exhibits. But we did enjoy the newly renovated Capitol grounds (there’s been a recent restoration of Frederick Law Olmstead’s original vision for a pedestrian park surrounding the building) and the boys definitely got a sense of its grandeur and beauty as well as a good look at the Supreme Court and the Library of Congress. Visiting the Capitol Building is a great way to get a visceral understanding of the size and scope of the U.S. government. Kids and grownups alike will leave with an appreciation for U.S. history but also with a sense of the importance of these collective spaces that we create as Americans. On every part of the tour visitors are told that the Capitol Building is intended to be the house of all American people, and although I know that at different times “all people” has meant different things (most recently the exclusion is primarily economic) it’s still a good reminder of what our democracy is striving to be and a fun way to show kids where the largest branch of the U.S. government resides. The Capitol rotunda is currently being renovated, which means the outside is covered with scaffolding and a donut of white plastic covers everything but the central painting on the inside. It’s expected to be finished in time for the next inauguration in 2017. 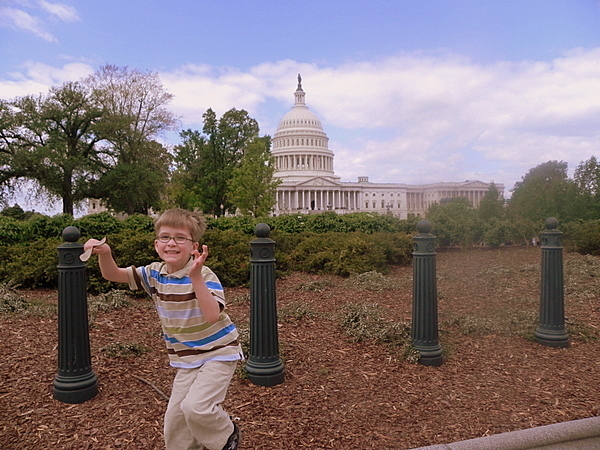 You should plan ahead for a visit to Capitol Hill with kids. I reserved tickets for our U.S. Capitol Building tour online and picked them up when we arrived. Saturdays tend to be less crowded and you may end up having a few extra rooms (like the original Supreme Court chamber) added to your tour. Tickets for the Capitol tour are free. 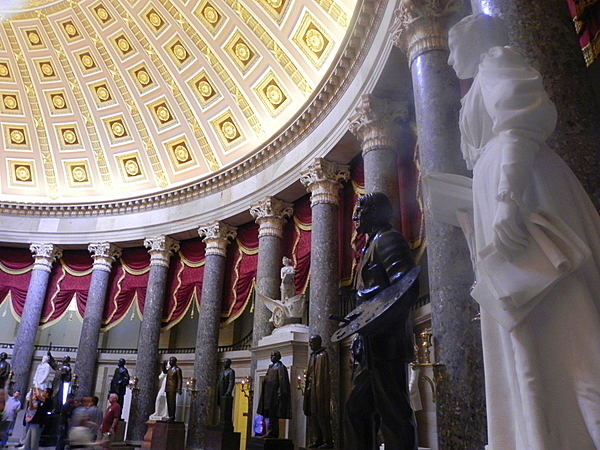 If you are on Capitol Hill with kids and don’t have tickets for a tour of the Capitol Building, you can still stop in the Visitor’s Center and check out the statues and exhibits there. There are clean and spacious bathroom and water fountains as well, making it a great place for a break with kids. It’s open from 8:30 to 4:30 Monday to Saturday. At six, Teddy was on the young side for paying attention and his interest definitely waned, but the tour was lively and short enough at about an hour that this didn’t become a huge issue. I wouldn’t bring a toddler or a preschooler on the tour though – boring for them, stressful for you. Got a kid who’s a history buff? You might want to make time for the other free special tours as well. These include guided walking tours of the grounds. Two good lunch options nearby are the food court in Union Station and the Mitsitam Café at the National Museum of the American Indian. 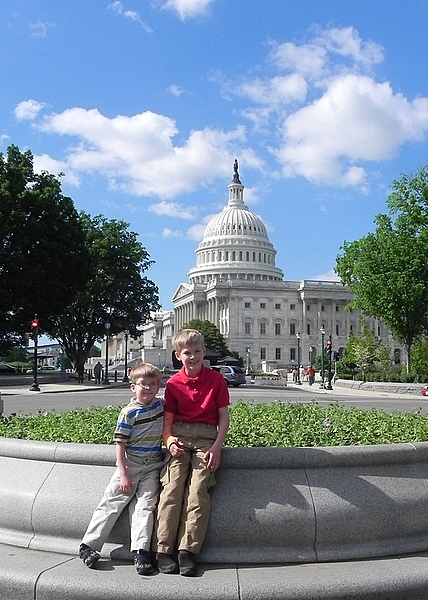 Get more tips on visiting Washington, DC with kids. Have you and the boys been to the Spy Museum? Great kid’s stop. And if you have a chance, visit the Jefferson Building of the Library of Congress. May sound boring to tour a library, but it is anything but. It’s been years since I visited Washington D.D. The Capitol Visitor Center sounds quite impressive. Will I be reading about a visit to the Smithsonian’s Air and Space Museum? It’s my favorite. Vera – The Spy Museum and the L.O.C. are both definitely on my list, though we didn’t make it to either on this trip. Donna – we didn’t get to the Air and Space Museum on this trip because we’ve been there before and wanted to visit some places we haven’t yet seen. But D.C. is close for us, so we’ll be back, hopefully soon! A few years ago we planned a tour through the capitol building through our congressman. Went to his website for info; they called us back and were terrific about scheduling all kinds of things for us. When we visited the Capitol, we went straight to his office and were given a tour by an intern who took us through the tunnels that connect the different buildings. It was great with the kids, because it was personalized for our attention level. As an extra bonus, several weeks later we received a letter from our congressman thanking us for our visit–very cool for the kids. Also Bureau of Priniting and Engraving has a great tour to do with kids where you see how they print money and then can buy the obligatory bag of shredded paper money- a plus for scrapbooking! Great tips Kristine. I know my kids would love a private tour – I just didn’t have time to plan one this time as our trip was kind of last minute. I’m glad we live close enough to DC to return easily and often. 7 hours ago by motherofalltrips Terrible drive today but made up for it by eating all the (uh-mazing) pizza.